The head of the well-known South Ural company “Tractor” Vladimir Andryushchenko about new development projects. Full-wheel drive Uralets with a rotary horizontal mower (one of the development of the company’s designers). — The issues of development of the agricultural sector of the country’s economy are one of the most topical today, – said the director of OOO “Tractor” Vladimir Andryushchenko. – Deliveries of equipment, including various sehosorudium, namely of domestic production, by the way, by quality today are not inferior to imported analogues, help to develop the industrial market. It is also about cooperation with profile companies. Today we have, in fact, clusters, on the basis of which such a technique is manufactured. This option has long been worked out in European countries, in other states, and it has proved its effectiveness. So, for example, our “Tractor” cooperates with such well-known manufacturing enterprises as “VarnaAgromash”, “Zarya” (Miass), Ural aggregate-mechanical plant, “Berkut”, “Yuzhuralrezina” (all – Emanzhelinsk) within the framework of intraregional cooperation. “Ironkat” (Sysert). In this regard, I note that the Deputy Governor of the Chelyabinsk region, Ruslan Gattarov, effectively solved the issue of supplying tires to our Nizhnekamsk plant. Until some time this issue was, for example, difficult for us to solve. – Market relations, cooperation, mutually beneficial cooperation, support of regional authorities – all this step-by-step led to the creation of such a cluster. This is a job, in the results of which every enterprise is interested. Plus, there are new orders, job creation. So, for example, I calculated that about 700 people are employed at cluster enterprises today. Partner enterprises make for us a number of components. In fact, thanks to this recently we launched the all-wheel drive model of our mini-tractor Uralets and the same model with hydraulic steering gear. The company launched a rotary mower with a horizontal cutting shaft, developed by Grigory Sinolitsky. 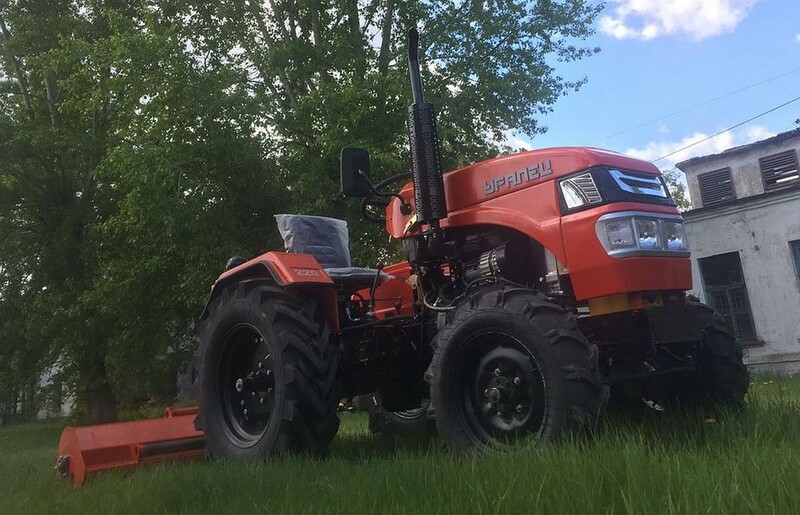 By the way, such rotary mowers, as well as our mini tractors “Uralets”, are ideally suited for working in horticultural farms, which are quite numerous in Moldova and Transnistria, as well as in the Crimea, Kyrgyzstan, and Krasnodar. One of these mowers we recently shipped to the Krasnodar Territory. The customer, a well-known entrepreneur in the region, was very pleased with the efficiency and productivity of this hinged equipment for mini tractors. By the way, the nearest imported analogue of such equipment now costs more than three times more expensive. The rotary horizontal mower is one of the developments of the company’s designers. – Your recent visit to the Republic of Kyrgyzstan opened new opportunities for cooperation. Now at one of the enterprises of the republic you manufacture radiators for mini tractors “Uralets”. – Moreover, we managed to open an assembly site of our plant in the capital of Kyrgyzstan. Now they have already started to collect mini tractors. We have already supplied to the republic more than fifty machine-sets, as well as various hinged equipment for the agricultural complex. At the enterprise “Kyrgyzavtomashradiator” we place orders for manufacturing radiators for our mini tractors. By the way, the plant is part of the Russian holding, whose head office is in Yekaterinburg. 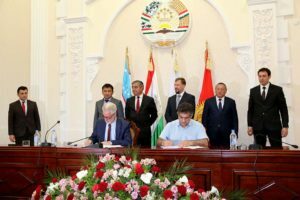 – Are such enterprises interested in Moldova and Transnistria? – Oh sure. Today, we ship our products to all regions of Russia and abroad – to Kyrgyzstan, Armenia, the Baltic countries, Kazakhstan, and Belarus. Our export director, Leonid Geladi, who worked as part of the South Ural delegation, described the possibilities of cooperation: the enterprises of Modova and Transnistria, the authorities of these territories, the profile ministries are interested in the development of small forms of business. This is on the one hand. 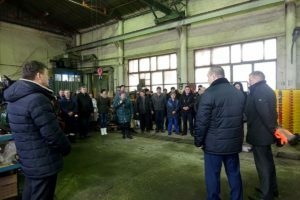 On the other hand, a partnership with the Ural machine-building enterprises will make it possible to modernize both the local fleet of agricultural machinery and the production itself, which today needs substantial renovation. We held preliminary talks, consider mutually beneficial options, are fully prepared to cooperate with Moldova, Transnistria. By the way, we presented the souvenir model of the Uralets mini-tractor to Moldovan President Igor Dodon. Ural delegation in Transnistria. The export director of “Tractor” Ltd. Leonid Geladi in the photo is the far right. – Now it is possible to buy equipment in leasing rather profitable. – Yes, there are such schemes. But they, as practice shows, are interesting mainly to large enterprises, those customers who purchase expensive equipment and are payers of profit tax and VAT. Our segment is not so expensive, so it is quite enough to buy a regular or soft loan for buying. Payback of the same mini-tractor Uralets “- one or two seasons. – But the same experts, experts recommend today to work with their own, Russian enterprises. Chinese technology is far from ideal. In the process of using this technique, you may encounter frequent and unpleasant “surprises”. We are talking about difficulties with the acquisition of spare parts (nodes for the same model may differ), attachments. The pulling power of Chinese tractors, as a rule, is two times lower than, for example, our “Urals”. In addition, such tractors are assembled from components from all over China, and there is no proper quality control. Difficulties can arise when registering a vehicle, especially the majority of them are sold without PSM. Our “Urals” are mainly produced on the basis of their own design developments, the assembly is on two production sites. And the high quality of products is also confirmed by experts working at industry exhibitions. For reference: In 2016, at the All-Russian Agricultural Exhibition “Golden Autumn”, LLC “Traktor” was awarded two silver medals – for the production of the mini-tractor “Uralets-220” and for the rotary plow-digger “Uralets”, as well as for the bronze medal for production of a rotary hinged mower H-17. Today the company occupies not less than 30% of the Russian market for mini-tractors. According to some estimates, in the Urals Federal District every second mini-tractor is produced in OOO “Tractor”. 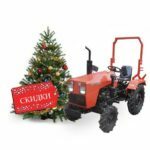 Last year the company was included in the federal list of the largest producers of tractors. The plan for the production of tractors at the enterprise is put under the control of the Ministry of Industry and Trade of the Russian Federation. – I note that the policy of the President of Russia is aimed at the work of the real sector of the economy, to increase the sales markets for domestic products. An example is quite productive cooperation with our former Soviet republics – now independent states. That is, the “bridges” for such cooperation are gradually being established personally by the President of Russia. The process is said to be on. There are, of course, some restraining factors. Take, for example, the payment procedure for certification of our products. In particular, trailers. I will not go into details, but the fact remains – several years ago this service cost 50 thousand rubles, now – five times more. With small volumes of sales, such a burden is borne by the manufacturer. By the way, one of these days in the government of the region the winners of the regional contest “The Best Employer” were awarded. The enterprise “Tractor” became a laureate in the nomination “The best employer”.